The On-Demand Start-Up Program for Home Health will introduce you to the licensed/certified home health agency business. It will review the necessary steps that must be taken to begin the process of agency start-up, help you understand requirements for facility, financial, time, and personnel requirements. This program will focus on how to create effective billing, budget, and other financial systems/processes as well as defining administrative and clinical processes, understanding regulatory compliance and getting the answers to: Who, What, Why, Where, How and When regarding agency start up. Explaination of the requirements established by the Center for Medicare and Medicaid Services (CMS) as related to receiving Medicare payments. Review of personnel considerations including the Administrator and DPCS positions, contract requirements, policies and procedures, information system needs and the documentation process including Electronic Medical Record (EMR) systems. Identify the essential components to effective marketing. Discussion of the liaison functions between agency and referral sources and the characteristics of good hires for the marketing/liaison positions. Compensation and other cautionary areas will be discussed. Review the basics of accounting. Discussion of operating budget, chart of accounts, balance sheets and income statements. The Medicare financial requirements for budgeting, capitalization and other aspects will be reviewed. Explanation of: referral/intake, orientation/supervision of staff, staff development/training, the clinical care model, documentation, and performance improvement. Review of the Federal Register and Medicare CoPs and the Interpretive Guidelines to Surveyors. Explanation of all Conditions and practical advice to ensure compliance. Identification of resources necessary to be successful in the business. Presentation includes: Accounting Software, Medicare Billing Software, Payroll Services, Unions, Benchmarking & Productivity and Education. Review of skilled care addressed in the Medicare CoPs including Physical, Speech and Occupational Therapies, the skilled nursing duties of an LVN and RN, plus duties and supervisory requirements of Certified Home Health Aides. Overview of Outcome-Based Quality Improvement/Management (OBQI/OBQM): purpose, reports, process, outcomes and value. Identification of the various government agency players in the home health field. Know who they are, what they do. How to avoid fraud and abuse. Examples of fraud and abuse cases will be shared. Explanation of the terms/acronyms: "Whistleblower", MACs, RACs and OIG and more. 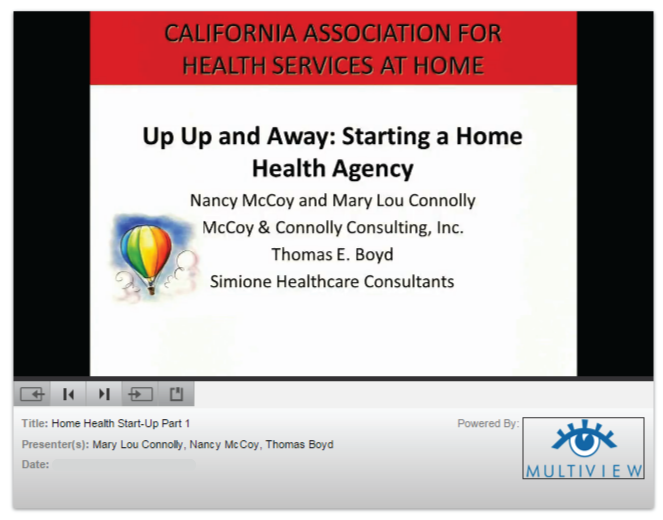 McCoy & Connolly Consulting, Inc.
Mary Lou Connolly and Nancy McCoy were Administrator and Director of Clinical Services at UCSD Home Care for over 10 years. After the medical center closed the home care operation in 2002, Nancy and Mary Lou started McCoy & Connolly Consulting. Their clients vary from small “Mom and Pop” agencies to multi-hospital systems with home health, academic medical center agencies and free standing community organizations. Their work consists of assisting agencies to: maintain regulatory compliance via mock surveys, operate more efficiently through the assessment of key agency processes, develop managers through education and mentoring, implement an effective patient care delivery model and develop and implement an acceptable Plan of Correction during and post survey. Prior to their experience at UCSD Nancy and Mary Lou worked in a variety of health care settings including home health. A highly respected member of the home care and hospice industry for more than 36 years, Tom is a nationally recognized expert in Medicare reimbursement. He serves as Simione�s Vice President for Reimbursable Services, and is based in Rohnert Park, California. A Certified Fraud Examiner (CFE) and Certified Healthcare Financial Professional (CHFP), Tom was inducted into the Hall of Fame at the 2013 National Association for Home Care and Hospice (NAHC) Financial Managers Conference. Prior to joining Simione Healthcare Consultants in 2014, he was principal with Boyd & Nicholas, The Cost Report People�, a consulting firm he co-founded in 1993 that grew to become one of the leading financial consulting firms for home care and hospice agencies. With expertise in cost reporting, financial analysis, due diligence and accounting, Tom served as an intermediary auditor for 12 years and a consultant for five years before founding his own company. He is a frequent national, state, and regional speaker on home health financial and compliance issues. Before earning his MBA from St. Mary�s College in California, he earned a B.A. in management and accounting from Sonoma State University. He is a member of the Home Care and Hospice Financial Managers Association (HHFMA) work group, the Association of Certified Fraud Examiners, and the U.S. Chess Foundation. If you do not receive these emails please call CAHSAH at (916) 641-5795 ext. 113. Once you receive your login information you may immediately begin accessing your on-demand course. On-demand course content can be accessed 24 hours a day, seven days a week from any device that has internet connection. The On-Demand Start-Up Program for Home Health comes with a total subscription length of six (6) months. If additional time is needed to complete the course, you may purchase an extension period of two weeks.